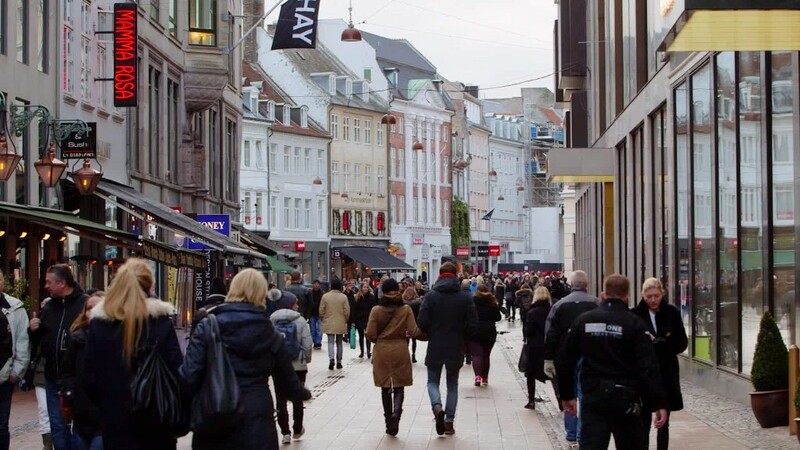 Could the Danish welfare state ever work in the United States? After keeping a tight hold on their wallets in the aftermath of the Great Recession, Americans are spending once again. The typical household shelled out $36,800 in 2014, according to a study published Wednesday by the Pew Charitable Trusts. That's up nearly 14% from 2004 and more than 25% since 1996. Much of the increase came after 2012, signaling that Americans are moving past the twin economic and housing collapses of the last decade. The jump in spending isn't all good news, however. Pew looked at household expenditures to get a better sense of families' financial health. Too often, experts only focus on income, said Erin Currier, director of the financial security and mobility project at The Pew Charitable Trusts. What Pew found is that families were more financially strapped in 2014 than a decade earlier. 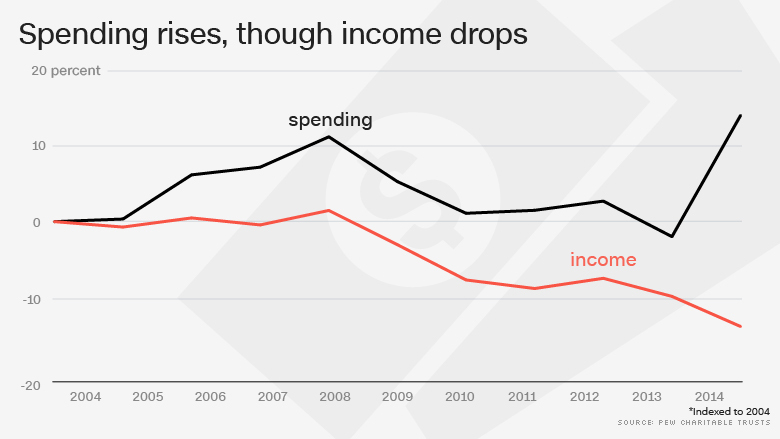 Spending has gone up, but income has not recovered. Median income fell 13% between 2004 and 2014, the report found. Housing drove much of the spending increase. It accounted for about 25% of families' spending in 2014. Food was the second largest expenditure, at nearly 10%. Lower-income households are really feeling the squeeze. Their annual housing costs grew by more than 50% since 1996, reaching $9,200 by 2014. Housing ate up 40% of their income. 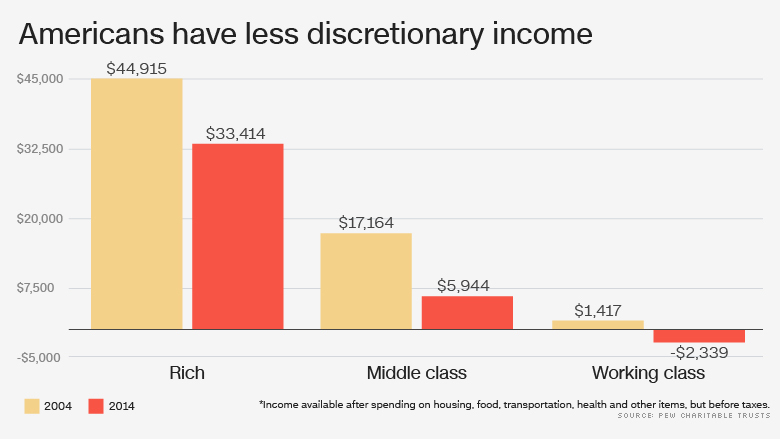 The middle class spent about 25% of its income to keep a roof over their heads, while the wealthy shelled out about 17%. CNN wants to know: Are you worried about the U.S. economy? Pew looked at the income and spending for a typical family of four in which both parents worked. In 2014, this family spent 75% of its income on housing, food, transportation, health care, entertainment and apparel. That's up from 71% in 1996. The only area that declined was spending on clothing. "The categories that have increased are things they can't do without, like housing and food," Currier said. Rising expenses and falling earnings have left Americans with less money at the end of the month to save, invest or spend on other items. 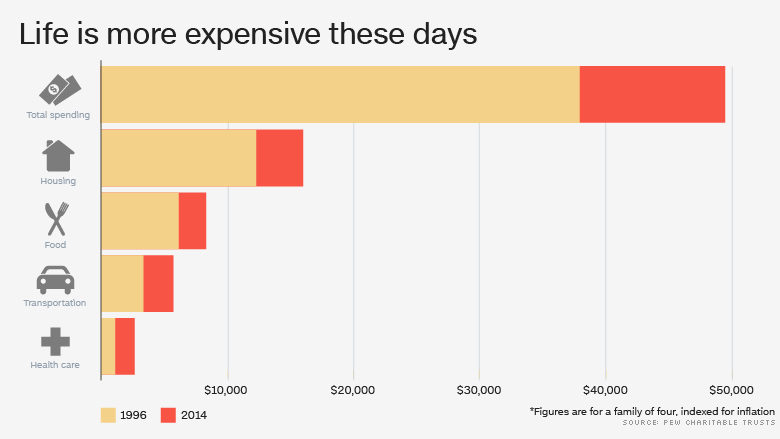 The typical lower-income family has fallen more than $2,300 into the red annually, forcing them to use savings, depend on family or friends, or turn to debt to pay their bills. Related: Middle class no longer dominates in the U.S.
Everyone, however, is feeling the pinch, and that makes it tougher for them to absorb any financial shocks, from a car repair to a medical bill to a job loss. A separate Pew survey found that the typical household cannot replace even one month of income with liquid savings. Its total financial assets equal only about six months of income. "They have less slack in their budget," Currier said. "That's a challenge to their being able to put any money aside for savings or to build wealth," Currier said.